*Starting in 2012, NFPA 99C will no longer be a standalone document. 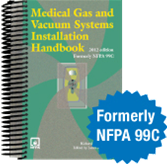 In its place, the full-color 2012 Medical Gas and Vacuum Systems Installation Handbook offers installers, designers, inspectors and verifiers a new targeted complete tool for specialized knowledge about Category 1-3. This one-stop source has all the latest medical gas and vacuum system rules plus valuable expert insight, explanations and full-color visuals you need to comply right and ensure high-quality patient care and facility safety.